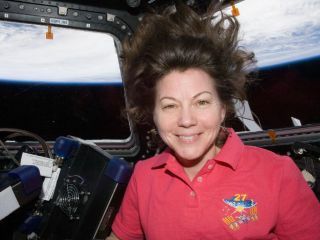 NASA astronaut Cady Coleman, Expedition 27 flight engineer, is pictured in the Cupola of the International Space Station. Earth’s horizon and the blackness of space are visible through the windows. Cady Coleman won't be the only mom spending this year's Mother's Day away from her child and family, but she will be higher up than any other. Coleman and her husband Josh have a 10-year-old son. "I miss them so much and I appreciate them," Coleman told the CBS television show The Talk, speaking recently from space. "It’s a lot of work for them for me to be gone. I'm just hoping that while I'm up here the things that I'll be doing end up being worth it, and I really think they will be." Coleman is a retired colonel in the U.S. Air Force, and has a Ph.D. in polymer science and engineering. This trip to the International Space Station is her third mission to space, following two stints on the space shuttle Columbia in 1995 and 1999. Coleman is scheduled to return to Earth on May 23 on a Russian Soyuz spacecraft landing in Kazakhstan. But even when Coleman has both feet on the ground, staying close to her family is never easy. "My husband lives in Massachusetts, I live in Texas, and I spent the last three years getting ready for the space station, spending about a third of my time in Russia, some in Japan, some in Europe," Coleman said during an educational event for the Women's Academy of Excellence in New York in March. "So I'm already a long-distance marriage person. I think if you have a challenging situation, you just have to figure out what's good for you and not worry about whether other people might think that it's different or not as good. For my husband and I and our son I think it works really great." Coleman admitted that being diligent about communication is the key to staying connected with the people she loves. "I can call on the phone from here every night," she said. "Certainly I've talked to them, I think every day but three days that I've been here. We do thing like read stories from space, my son and I, and I try to make sure that we talk about all the important things that husbands and wives need to talk about." Coleman even brought up a stuffed "Hobbes" tiger from the comic strip Calvin and Hobbes, which she carries around the International Space Station to help her son get into the space spirit. "I bring Hobbes with me to do experiments and I take pictures and send them down to the ground so he understands what I'm doing every day," Coleman said on The Talk. Coleman is one of six astronauts living on the space station right now. Her crewmate, Italian astronaut Paolo Nespoli of the European Space Agency, will be having a more somber Mother's Day after receiving the news that his mother died on Monday (May 2). The astronauts, along with Mission Control on the ground, all took a moment of silence to honor her Wednesday (May 4) following her funeral. "We are remembering her by looking at the beautiful view from our cupola of our planet," Nespoli said then. "We are sure she has the same view from where she is now."